50% deposit is required . 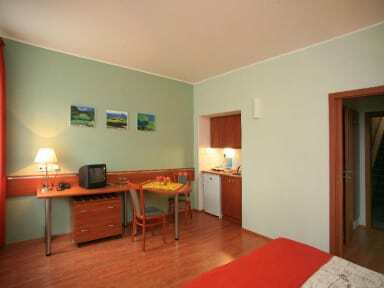 Cancellation free till 21 days. Additional breakfast can be booked. 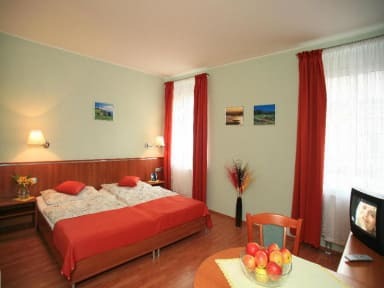 There is a kitchen unit in every room so you can cook your own meal or you can enjoy Czech breakfast every morning downstairs /price 7 Euro/per person/day/. Rooms are equipped with private bathroom with shower and a toilette, 2 towels per person, satelite TV, fridge, kettle,dishtowel, alarm-clock, cooking stove and anti-allergic pillows and blankets.There is WIFI available in every room on request. Regardin your children, we can provide cots, stools and variety of boardgames free of charge. There is also a secured parking lot behind our Guest house FAN***. You can buy municipal transport tickets at the reception and we can store your golf bags/bikes in a secured room. Excelen drinking water from the tab.